As a kid, my grandfather often took us there when he was selling cattle. He raised Angus and his brother raised Herefords. Uncle Porter’s champion bull’s hide once covered a frame and was atop the Hereford Building for years. Guess it finally rotted beyond repair. Memory is sketchy but I believe this bull was the largest of the breed at the time. A friend worked there as a waitress. She said it was necessary to pretend to be surprised when a roach was spotted. There was a room no one wanted to enter because of the infestation. My one trip to Kemper was to see the Flyers play the Scouts. In town for Christmas with my ex to announce our expecting twins, the Scouts thumped the Flyers. This was the year after the second Cup. At least Freddy Fender was good after the game. My youngest twins attended the American Royal as FFA members the last time they met here from Oley HS in PA. I wish I could recall the Scouts beating the Flyers. Must have been the highlight of the Scouts’ two years in Kansas City. They were absolutely horrid in their second year — ’75-’76, when they won only one of their last 44 games. That’s not a misprint: they prevailed in one of their last two score and four hockey games. Thanks: Nora and I were considering strolling down that exact memory lane tomorrow. After reading your sad obit I believe we will instead head south to Jess and Jim’s. Good call, Will. The reality could easily crush the nostalgia…And we all want our nostalgia to be pure. Mike and I went to the Golden Ox to celebrate our engagement…2/15/1986. It was a very special night. I’ve never been back, and hold the memory in a “time capsule” in my mind! How sad — they have clearly begun the death knell, when they could have gone out with a big, boisterous, juicy, flame-kissed BANG. I remember an American Royal rodeo where the opening act for the main musical attraction (whom I don’t remember) was a relatively unknown duo named Brooks & Dunn. Nice turn of phrase there, Gayle…and interesting tidbit on a great C&W group. 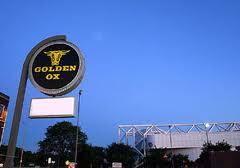 What a sad commentary on the Golden Ox but loved your memories of Kemper Arena. And you make me want to try Voltaire. I wish there was a way to resurrect Kemper, convert it into a pleasant, comfortable space. Basketball would be the best option, but not an NBA team. If another league would materialize — something like the old American Basketball Association (ABA) before it merged with the NBA — it could be a good fit. Or maybe a WNBA team (women pros). In any event, it would be a big gamble and it would take someone with a lot of disposable income. Also, the city would have to pour millions into it, and I don’t know if there would be any willingness among the City Council to do that. The now-dead Foutch Bros. plan to convert it into a youth sports facility didn’t strike me as very promising, mainly because all that action is concentrated in southwestern Johnson County. It might have been good for a year or two but probably would have faded, just like the Scouts. Also, revitalization of the arena would require concurrent redevelopment of the restaurants and bars in the immediate area. Voltaire provides a good foundation, now holding down dining centerpiece status. Getting a good tenant for the Golden Ox space — and doing a complete renovation inside and out — would be Step 1 in the ancillary redevelopment. The old Genessee Inn (now called Grandma’s Bar or something like that) would need renovation and new ownership. And, finally, a few new places — lively and with good food — would have to be added. As we’ve seen with Power & Light and the Crossroads, concentration is everything. And I think the KC market is certainly big enough for a West Bottoms/Kemper Arena entertainment pocket district. When I met my future wife, we used to eat there quite often in the 90s. The food was good and usually the service was OK and I loved the atmosphere. Then, in 2001 I took some co-workers there for a reward for hard work and got lousy food and a manager who was hostile to my complaints. Never went back and quickly lost my nostalgia for the place. It had a couple more owners after that, but I did not care anymore. Good riddance. The place long ago lost whatever it had. Jim, I think my best memories of Kemper Arena revolve around the indoor soccer team that called the place home back in the ’80s, the Comets. The atmosphere was simply electric at the time. I can still hear the music playing in my head. I think I might have gone to one Comets game, but I was never interested in indoor soccer. I was, however, interested in the fabulous Leiweke brothers — Tracey, Terry, Tim and Tod — each of whom has at one time or another made a relatively big splash in pro sports. I never met Terry and don’t think he ever lived here. But I knew the other three, and, oddly enough, Tracey, who seemed to have the biggest, most gregarious personality, disappeared from the arc lights early on and settled on a ranch or farm, I think, in the Pacific Northwest. The three of them — Tracey, Tim and Tod — did a sensational job selling Kansas City on indoor soccer and the Comets. 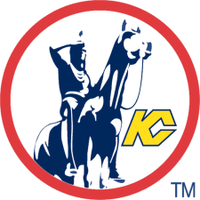 They injected a lot of excitement into KC for a few years. Fact check: The Wings concert was at the end of May, Fitz. I was there. The google sez so, and so do the concert promoters, who I met last weekend for the first time. But it probably was a hot night. Failure to verify, Mike. Thanks. You were probably channeling Neil Diamond when you wrote that, Jim.